Re: Paint advice needed please. I have the twin of your bike.I think the original colour was called Candy Red. I have that on an original invoice from Shenstone.See previous posts on handlebar shakes. Most of us get them!!!Derek. Yes,black on lower fairing, Krauser luggage rear tail piece. Centre stand lifting handle. No front daytime riding lamps. Fitted with Krauser K2 panniers & Krauser top box after purchase.Delivery date: 24-4-1992.No. 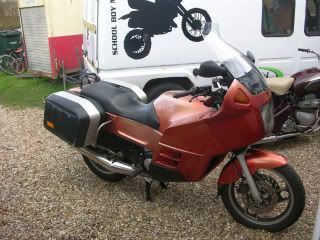 4265Sale price: £6,680.76.Molyed at 25,400 miles in 1997 at a cost of £1,175.00. Current milage 90,000.Cheers,Derek. 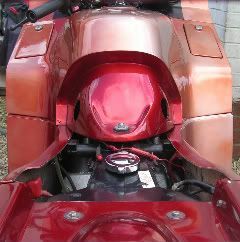 Candy Apple Red, Dream Machine was one of the Factory Approved Painters.